Love the thrill and adrenaline of extreme sports but don't have a fortune to spend getting the right kit? With a Ripped Knees discount code you can enjoy fantastic savings on a wide range of gear and accessories with a particular focus on custom scooter builds. With everything from decks and handlebars to pre-built scooters, skates and more. A Ripped Knees voucher code will help you be your best – without breaking the bank. Founded 3 years ago, Ripped Knees was established to provide a one-stop online shop for all the best scooter parts and accessories. Today, they have achieved their goal and enjoy an enviable position as the UK's leading independent stunt scooter store, supplying thousands of satisfied customers with everything they need to enjoy their favourite hobby. Ripped Knees are committed to providing the very best quality parts and accessories from the top global brands – all available at competitive prices. What's more, they're dedicated to the very best customer service, so your shopping experience will be first-rate from start to finish. 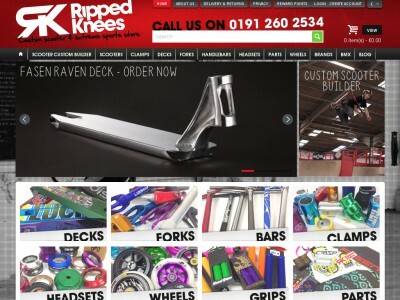 At Ripped Knees you'll find a wide range of scooter parts and accessories as well as equipment for a selection of additional extreme sports. The company specialises in custom built scooters – use their unique 'Custom Builder' feature to put together a scooter to your individual specifications. Ripped Knees will source all the individual parts, put together your scooter with expert skill then and deliver it straight to your door. You can also use their website to purchase individual parts to upgrade or update your scooter. From decks and handlebars to wheels, forks, clamps and more, you'll find all the equipment needed to build the ultimate set-up. Concerned about safety on your scooter? Ripped Knees stocks a selection of headsets designed to give you peace of mind while you ride. Got a favourite scooter brand? Ripped Knees' official website offers the chance to browse by label – so it's easy to find the products you want from the names you trust. Want to find out more about scooters or buying a gift for a loved one? At Ripped Knees you'll find a dedicated team of staff who are passionate and knowledgeable about their sport – so they'll be happy to give you tips and advise you on the very best products to buy. Ready to get shopping with Ripped Knees? With a Ripped Knees discount code you can enjoy fantastic savings on their wide range of scooter and extreme sports accessories. So whether you're a dedicated enthusiast or just getting started, Ripped Knees vouchers will save you money while you shop. Innovative 'Custom build' function lets you put together your dream scooter. Browse our website until you find a Ripped Knees discount code that suits you, then navigate to their website to begin shopping. Enter your Ripped Knees vouchers in the box provided and click 'Apply coupon'. If you've enjoyed shopping with Ripped Knees, you might also like to check out more great deals on extreme sports supplies at stores like JD Sports or Sports Direct. Or, if those aren't up your street, you'll find plenty more deals to browse in our Sports section. Standard UK delivery is free on all orders over £60. For orders under £60, a delivery charge of £2.49 applies. If you need to return a product for any reason to Ripped Knees, you can do so by simply returning your items in their original packaging within 60 days of receipt. Need to contact the team at Ripped Knees? Whether you have a question about your order, want some expert advice on custom building your own scooter or simply want to know more about how you could make big savings with Ripped Knees vouchers, you can contact the Customer Services department by telephoning 0191 232 8028. Want to find out more about Ripped Knees? The company maintains a profile across all your favourite social media platforms. Follow them for lots of entertaining content including competitions, promotions, custom build sneak peeks and more. You can also use these pages to find out more about saving money with Ripped Knees vouchers. Don’t forget to check them regularly, as you can never be sure when a free Ripped Knees discount code might be waiting for you! Buy now online at www.rippedknees.co.uk. My teenage nephew wanted a custom built scooter for his birthday, but it sounded so expensive! Then I discovered a Ripped Knees discount code online. With a Ripped Knees discount code, you can visit rippedknees.co.uk and get great deals on a wide range of scooter accessories – including a fantastic custom build service. I used my Ripped Knees voucher code to make big savings on exactly the set-up he wanted – and now I'm definitely the cool uncle! So if you're shopping for scooters, see what you could save with Ripped Knees vouchers.